Optical isolation to 4000 VAC. On-board LED status indicators and inline fuses. The T2SS I/O module expansion card provides dual socketed interface channels for industrial standard miniature I/O modules to a 1-Wire bus. 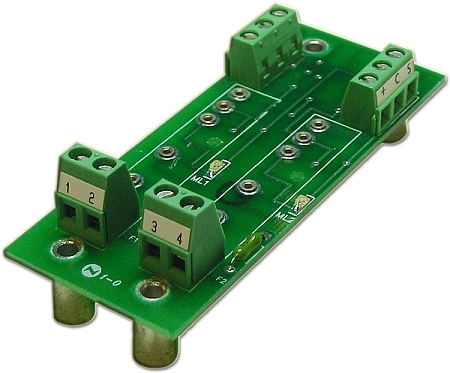 These modules can accommodate AC voltages as high as 280 Volts and currents to 3 Amps. DC voltages from 4 to 200 volts and currents to 3 amps. Dry contact relay output modules such as the Grayhill 70M-ODC5R can also be accommodated. All these industrial standard modules provide 4000 VAC isolation. The T2SS has a built-in multidrop controller (DS2406) which provides a unique 64 bit registration number (8-bit family code + 48 bit serial number + 8 bit CRC) assuring error-free selection and absolute identity; no two parts are alike. Unique addressing allows I/O function to be identified absolutely, no more dip switch address confusion. Status input, latched-input-activity and output-latch functions allow input, output and fast event catch functionality to hundreds of I/O points on a 1-Wire bus. The T2SS is designed to allow a network of isolated input and output modules to operate on a two or three wire bus, power("+"), common("C") and signal("S"). The T2SS can be powered locally or the power may be bussed with the1-Wire signal in a three wire system. The bussed power can be unregulated 6V to 16V DC. The T2SS provides onboard 5-volt regulation for I/O module operation. The onboard power supply has a very low quiescent current and low dropout voltage to allow long cable runs with minimum loss. The T2SS can be stacked side by side for minimum panel space, or they can be spaced hundreds of feet apart to minimize high voltage wiring. On board inline fuse, LED status indicator and strain relief are provided for the I/O modules. The T2SS is compatible with the EDS OneSix DDE server and family of 1-Wire enabled devices, as well as any 1-Wire host with support for the Dallas Semiconductor DS2406 Dual Addressable Switch.